A sports stadium or entertainment centre is a location that benefits from a few to hundreds of screens. A robust management and playback system is vital for the efficient running and playback of information to thousands of visitors. Flexibility is required for the many options that make up a digital signage system for Stadiums and Entertainment Centres. The Navori system allows for the display of content, including TV feeds and media files, on a group basis. At the same time, specific media files can be assigned to a single player for the display of targetted or corporated advertising relating the Corporate Box sponsor. This allows the management of the system with a single group but multiple players and different advertising content - reducing the complexity of managing a large complex system..
Interactive support is provided through the Navori player system allowing the viewer to see the standard feed but to also interact with the display and a multimedia presentation..
With large stadiums, the controlled movemement of people is virtal. The system determines the best route from that location and supports multiple venues, multiple levels and can even direct outside of the stadium. The Navori QL system allows content to be altered within the application or external of the application. For example, an xml feed could be taken from a POS system with pricing information. This information is fed in to Navori to populate the data on the screens. 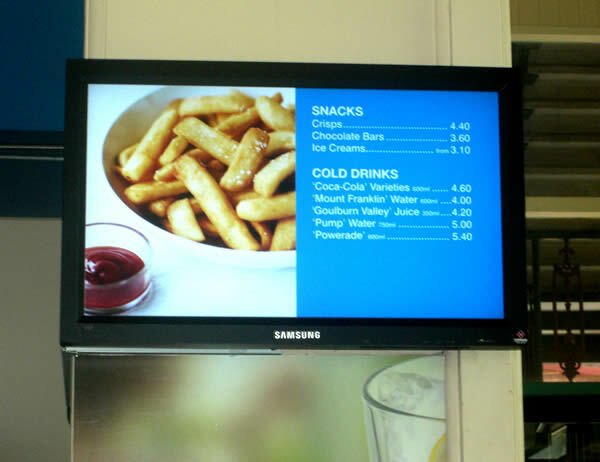 While the match is on, a digital menu board can be changed from a full screen menu to a 50/50 display. Half of the screen could be a menu, the other half of the screen could be an IPTV feed displaying the action – with audio. Your outlet customers won't miss a thing while purchasing their food or drinks. During breaks, the screen could be full digital menu display. Navori can take in an IPTV feed for the controlled distribution of audio and media playback.. This can be displayed in either full screen mode, or with the Zoning feature can display on just part of the screen. Navori can also output to an IPTV system to generate the stadiums own entertainment channel..
IPTV could be used for the general display of the match on the screens in stands. Or a combination of additional information plus the IPTV feed could also display on the stand screens.